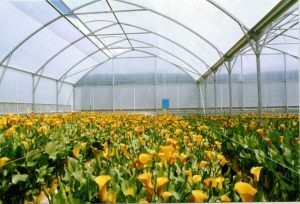 Offering a controlled growing environment, Greenhouses produce ventilation and warmth for research facilities, home use, crop cultivation, flowers, and seedlings, allowing for a longer growing season. Greenhouses provide protection from the weather, pests, disease, soil erosion and unwanted pesticides. We supply Redpath NZ greenhouses and shade houses with a clear plastic film roof and sides, allowing light in while conserving heat. We provide the full range from home use to commercial growing, and can construct on site with our experienced team of staff. We also offer a range of products including greenhouse films, side rollup walls and roof vents. Ventilation is one of the most important components in a successful greenhouse, and this can be achieved with the use of side rollup walls, roof vents, or air circulation fans. The main purpose of ventilation is to regulate the temperature and humidity to the optimal level, and to ensure movement of air. If there is no proper ventilation, greenhouses and their growing plants can become prone to problems and disease. All greenhouses come with a manufacturer’s warranty. We also offer maintenance on greenhouses, including re-skinning of roofs by our specialist team.